A Culture Captured by the Ultimate Outsider One day during Hanukkah 26 years ago, the grand rabbi of the Lubavitch-Chabad Hasidim briefly turned away from the hundreds of men gathered before him in synagogue to cast his eye toward the women’s balcony. Then he extended an arm, offering someone there a roll of nickels. That recipient, in turn, was meant to fulfill the rabbi’s design by giving the coins to charity. It was rare enough for Rabbi Menachem Mendel Schneerson to direct his attention to the women’s section, which was kept separate in accordance with Orthodox practice. Rarer still was the rabbi’s target: a female photographer who was not Lubavitch, not Hasidic, not Jewish, not religious, not even American. That photographer, Chie Nishio, stood in the lobby gallery of the Brooklyn Public Library one morning last week, regarding the picture she took of Rabbi Schneerson’s long-ago gesture. She is 84 now, a widow, living by preference without a cellphone or email account. Yet an extraordinary collection of her visual art is now receiving its belated recognition. Of the 43 photographs of the Lubavitch community currently on display in the library’s main branch at Grand Army Plaza, that print of Rabbi Schneerson on Hanukkah most hints at the story behind the images, the story of Chabad Hasidim’s improbable portraitist. When the photo was taken in 1988, Ms. Nishio had been visiting the Lubavitch movement’s home base in Crown Heights, Brooklyn, for only a few months. While Rabbi Schneerson implored his followers to reach out to fellow Jews of any level of observance, his decision to acknowledge Ms. Nishio was a very public sign of approval for an ultimate outsider. His decision proved to be a wise one. 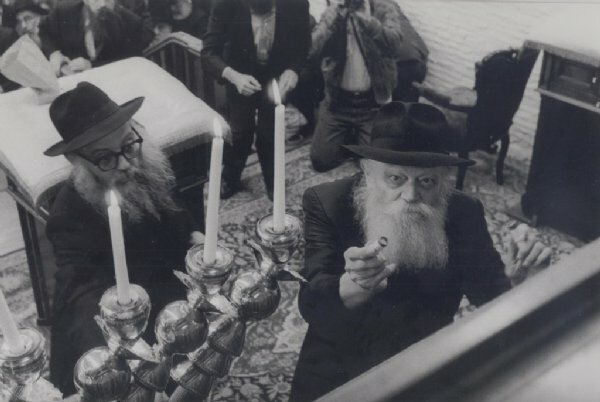 Ms. Nishio went on to photograph the community until the grand rabbi, known to followers as the rebbe, died in 1994. The library’s exhibit, which remains on display until February, provides an intimate and expansive view of the Lubavitchers. In Ms. Nishio’s photos, a scribe letters a Torah scroll and a baker wields a tray of matzos. A bride-to-be, who will have to cover her hair for reasons of modesty, tries on her first wig. In a ritual called upsherin, a 3-year-old boy receives his first haircut, the sign that he will soon begin his religious education. There are portraits of Chabad women who work as a lawyer, a painter and a magazine editor. These photographs attest not only to Ms. Nishio’s meticulous skill, which she honed over a half-century, but to the condition of her soul, a capacity for empathy across both literal and metaphorical oceans of difference. The daughter of a railroad mechanic, Ms. Nishio grew up in a Japan ravaged by World War II. Unable to afford college, she went to work as a self-described “office girl.” Only in the early 1960s, when she was already in her 30s, did she find a two-year trade school for photography. There she fell in love with journalism. After marrying an American author, James Trager, in 1972, Ms. Nishio moved to New York. Though Trager was an ardent atheist, his lineage traced back to an immigrant rabbi, Abraham Trager, who founded an Orthodox synagogue in Columbia, S.C., in the late 1800s. Over the succeeding generations, the extended family bitterly splintered into religious and irreligious factions. So she went to one of the most visibly Jewish parts of Manhattan, the Diamond District, and from there was directed to the Satmar Hasidic community in Williamsburg, Brooklyn. Upon arriving, she was rebuffed, and was advised instead to try the Lubavitchers in Crown Heights. Emerging from the Kingston Avenue subway station in the fall of 1988, she lifted her Nikon F to her eye and heard a Hasidic woman shout, “You can’t take pictures!” She put away the camera, wandered onto a side street, and spotted a father playing with his toddlers. Again, she prepared to shoot. Again, she was told no. The father, however, took the time to explain. It was one of the holy days of Sukkot, when work is proscribed by religious law. But if Ms. Nishio was willing to return on an ordinary day, the man said, she could photograph his family. On a Crown Heights sidewalk a few days later, Ms. Nishio caught the curious eye of Chana Seligson, a young mother who was a preschool teacher. Ms. Seligson invited the photographer home, and over the succeeding years Ms. Nishio shot the Seligson family in myriad moments — the children dressed in costumes for Purim, and the parents grimly reading newspaper accounts of the 1991 riots in Crown Heights. Even so, Ms. Nishio’s photos of Crown Heights nearly fell into obscurity. She essentially stopped working after 2006, as her husband fell ill and she looked after him until his death in 2012. A family friend submitted a portfolio of her Lubavitch photographs to the Brooklyn Public Library in early 2013 for consideration.